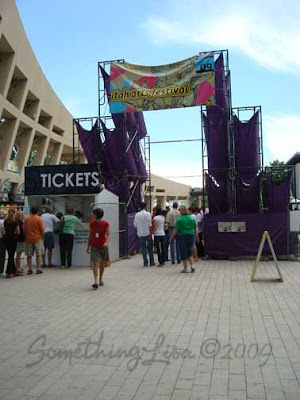 The Utah Arts Festival has been going on for many many years. A long time ago a friend at church was one of the directors of the festival and I volunteered to paint children's faces. I returned each summer for a couple of years putting in a few hours here and there. I'm not sure why I stopped volunteering - perhaps because the twins were born. We make it to the festival about every other year nowadays. 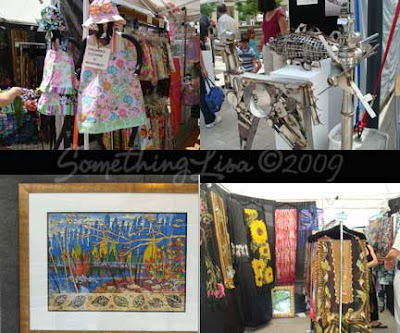 This was the year so my three girls and I headed off to the Arts Festival between rain storms and as always we saw some amazing art. I am always amazed at how clever people are with their art, like the recycled metal sculptures. I definitely recognized the cloth on the children's clothing. I also love seeing art which makes me wonder if I could do it too - usually the answer is "no, no I can't" and that is why I love seeing it. 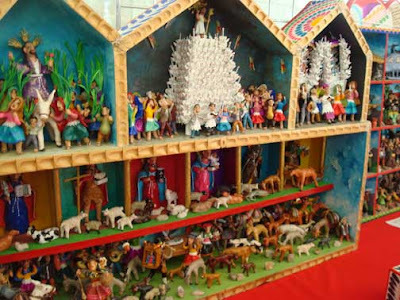 The figures on these Peruvian pieces are so small and have wonderful little details. Each "house" tells a different story. 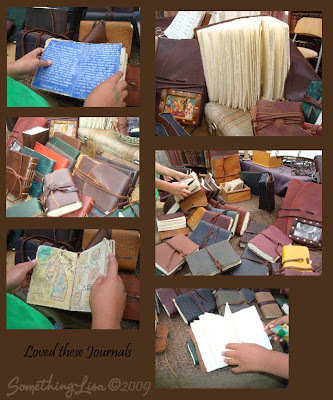 I fell in LOVE with these journals from Iona Handcrafted books. They are so earthy and beautifully made. If I had had the money I would have bought one and treasured it instead of writing in it so it is a good thing I didn't have any money because they are made to be written in! I was a bit sad when we visited the Children's Art Yard as my girls are kind of too big for it now. I loved that they were selling peanut butter and jelly sandwiches with a cup of milk for the kids! This booth outside the Children's Art Yard made us all drool a bit. The twins both wanted the bow and arrow set as well as a puppet. My older daughter and I loved the flower headbands, fairy wings and princess crowns. 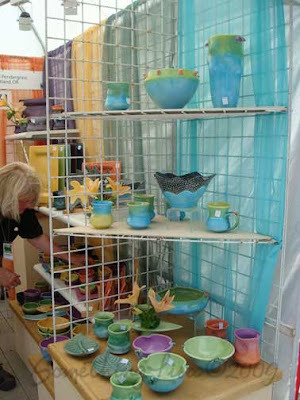 There were a number of potters at the festival. This set of dishes really caught my eye. I love the bright colors. There was even a yard dedicated to Urban Art. You could buy personalized tennis shoes or hats as well as these paintings. 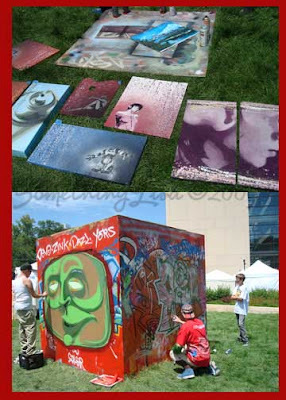 The art on the cube was being made and remade. It amazes me what a person can do with spray paint! 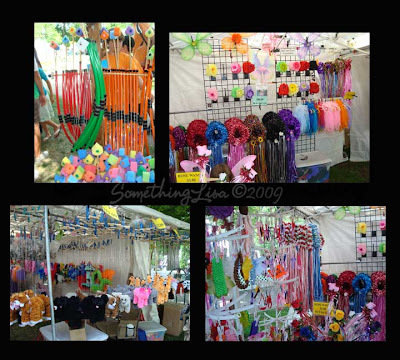 The festival takes place on the grounds around Library Square and Washington Square. We dashed into the Library to cool off for a bit. I love this Library. It is beautiful but I love the small homeyness of my local branch, plus it's closer so I don't come here very often. My friend, however makes the trek and volunteers here every week and likes to share funny stories about the crazy things people do at this library. And there are some very crazy things! Funny thing is I don't have any pictures in which you can tell this is a library at all. 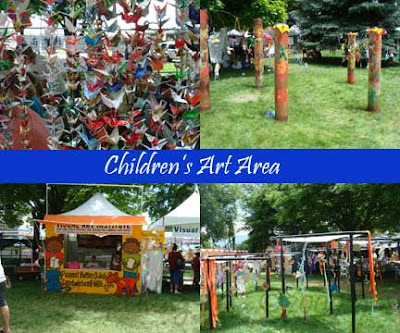 There is so much more to it - especially for two more days with the Utah Arts Festival going on right outside. I haven't been to this in years. i remember when it used to be free. I think that the last time we went, we got in free with our Starzz tickets. It was held in the street outside the Delta Center. Michelle Shocked performed. It was fun. Mild weather helps this year. Some years it has been very very hot. Looks like you had fun. I love the pictures. 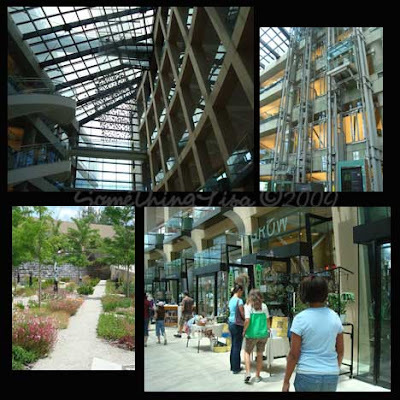 I especially love the pictures you took of the library and its gardens. I never think to bring my camera when I go. I guess that's probably a good thing because I'm sure I'd take pictures of the crazys and be escorted out with the charge of voyeurism. Did you get rained on? I hope not.